Flights of fancy and dress-up fill his days. She’s rough-and-tumble, a scrapper in her mind. Make-believe has always been a big part in your child’s life but now you’re hearing something you know in your heart is not pretend—and in the new book Raising the Transgender Child by Dr. Michele Angello and Alisa Bowman, you’ll find guidance for it. In retrospect, you might’ve seen it coming: your son told you once that he was really a girl. Or your daughter cried when you wouldn’t let her get a buzz-cut. You’ve suddenly realized, or your child has told you, that zie is gender-diverse. Either way, Angello and Bowman point out that few parents are immediately one-hundred-percent prepared for raising a child like yours. And by the way, as for shaky “studies” and internet myths, set them aside. There are many theories on “what leads to gender diversity,” and a lot of unknowns. Again, put arguments away and ignore negativity; all kids are different, and so are their gender experiences. Is it worth obsessing over? Probably not; you love your child regardless, so prepare yourself for a toe-dip into “social transition.” Talk with teachers, neighbors, and take steps to make relatives aware of new pronouns and appearance. Educate yourself on public bathrooms, team sports, and other legalities. Know when to ask for help—both financial and emotional. Remember that grief is common, and that your child may experience issues, too. As a parent of a transgender child, you may think that all this is common-sense stuff you’ve heard before—and that may be so, but there’s a certain calmness inside Raising the Transgender Child that can’t be beat. The other thing that sets this book apart is that is its comprehensiveness: authors Angello and Bowman seem to have thought of everything Mom, Dad, or caregiver could possibly need to know about present issues and what’s to come. It’s all easy to comprehend, too, and it covers children from small toddler to older teen. Particularly vexed parents will be happy to see that the authors even tackle unpleasant situations, and emotions that may need to be heeded along this journey. 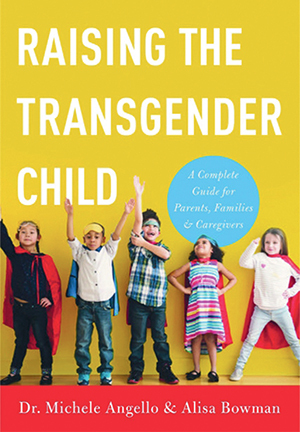 Whether you need it now, or you sense that you might later, Raising the Transgender Child is a good book to have in your parenting bag of tricks. For questioning children and families with questions, it’s more helpful, perhaps, than you can imagine.